As Winter is fast approaching, it's easy to put our outdoor adventure plans on hold. For a few months, we hibernate inside with warm blankets and an extra layer of holiday fat on our bones. 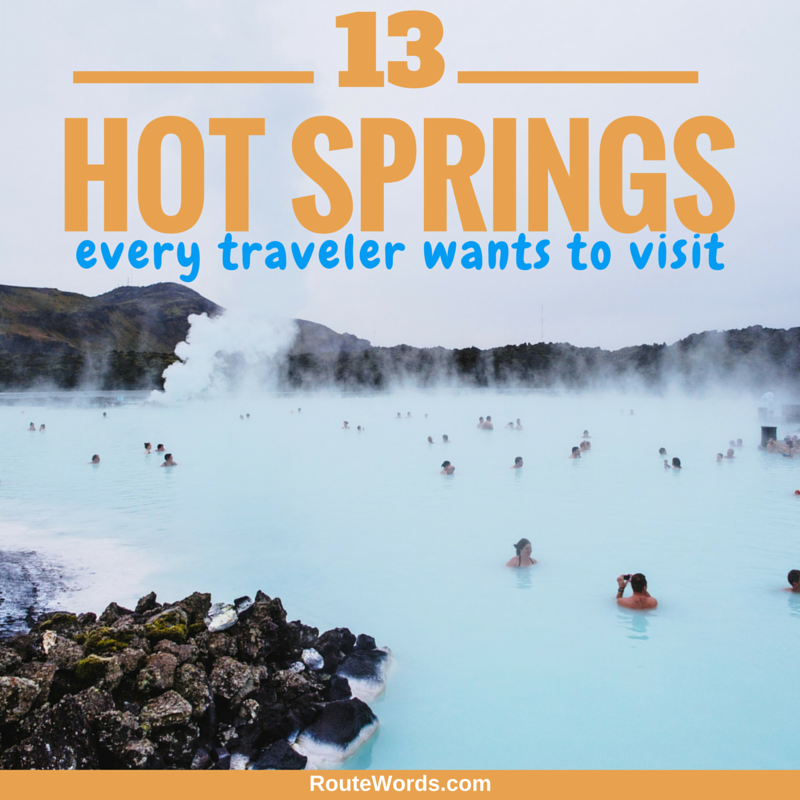 If you need inspiration to fight those Winter blues and get outside, consider combining an outdoor excursion with a relaxing visit to one these 13 hot springs across the world. When it comes to hot springs, arguably one of the most famous is the remote Saturnia. Set among the picturesque hills of Tuscany and shaded by cypress tress, the springs were formed when the Roman god Saturn crashed a lightning bolt into the soil. While the myth may not match the geology, it can’t be denied that visitors have been coming here for thousands of years to soak in the warm waters. We discovered it from a photo on the Internet and drove for hours in search of the springs. It is every bit as magical as the pictures would lead you to believe! We spent an afternoon soaking in the warm water, eating a picnic on the banks and staring in awe of its beauty. If you visit, don’t forget your water shoes (the bottom is very rocky). Lance and Laura Longwell are authors of Travel Addicts. They enjoy long road trips in unusual corners of the world, dipping into a hot spring, and drinking the local wine. "I'd been shivering for the majority of the last two days. Thermals were on, ski jacket zipped right the way up and alpaca hat and gloves picked up in Cusco to complete the look. I was on the last day of the Bolivian salt flats tour, heading towards the Chilean border and really, desperately hoping for some sunshine to warm me up. I was in luck! No, not sunshine but hot springs! Ariving just before the sun rose and having stopped off to admire some geysers along the way, we pulled up in our 4x4 to the beautiful hot springs near the Chilean border. The springs are pretty much in the middle of nowhere but have a small changing room available. Sitting in the hot springs with mist rising up off the water and watching the sun rise was magical. I'd highly recommend braving those 30 seconds of madness as you run from the changing room to the water!" Hannah is the writer behind That Adventurer, a travel blog which aims to inspire people to try new things and see the adventure in the everyday. Yellowstone National Park in Wyoming is a haven for geothermal activity. From some of the world’s largest active geysers to stunning hot springs, Yellowstone is certainly the place to be in the United States to experience this type of natural phenomena. One of the benefits of exploring Yellowstone is that the national park is divided into a number of areas that you can actively see geothermal activity. Norris Geyser Basin for example is one of the more ‘hidden’ areas, though with the world’s largest geyser in Steamboat it should be near the top of most of your itineraries. Emerald Spring is a gorgeous hot spring here that is 27 feet deep and provides a stunning crystallization appearance along with the obvious emerald looking water. Beryl Spring located in the Gibbon Geyser Basin offers another distinctive attraction and is easily accessible en route around Yellowstone’s Grand Loop scenic road. A sidewalk offers visitors the opportunity to capture up close photographs but it is the strong smell as you approach this part of Yellowstone that makes it apparent you are stumbling across a real gem! Meanwhile probably the most famous part of Yellowstone is the home of Old Faithful in the Upper Geyser Basin. The beauty here is not so much Old Faithful itself, rather the myriad of pools and hot springs that are bubbling away as visitors wander around in anticipation of the next eruption. We were incredibly fortunate to see the eruption of Beehive Geyser, which occurs only once each day. 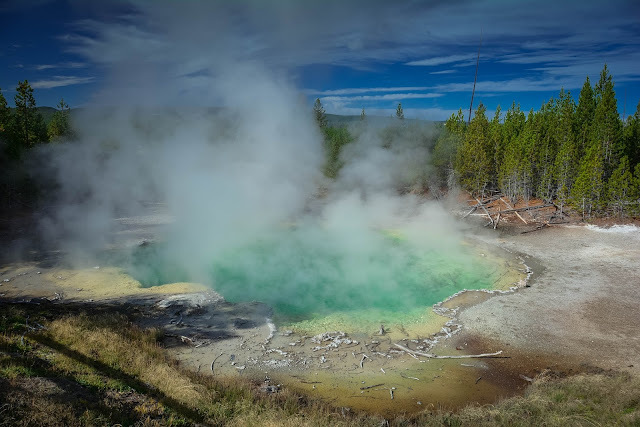 Yellowstone is of course more than just a hub of geothermal activity, but a trip to this part of Wyoming would not be the same without experiencing this variety of natural beauty. Chris and Heather Boothman are on a journey to ‘Explore the world one weekend at a time’. Join them on their adventures at A Brit and a Southerner. I was hitchhiking around Iceland, while spending my nights cozied up inside my tent. Though I was far from freezing to death, it wasn’t exactly warm out. I was craving some heat. An American couple sketched me a map, which led off the ring road down highway 242. After a short fifteen minute hike, there it was in all its glory: Seljavallalaug. This swimming pool dates back to the 1920s, and is free to swim in. It is heated by hot spring water, which trickles in at one corner of the pool – making that the most glorious place to put yourself if you’ve been rather cold for days on end. The view is nothing less than spectacular; tall mountains surround you, sprawling up everywhere you turn, with innumerable waterfalls trickling down their slopes. Since the water is closer to lukewarm than steaming hot, with the exception of the corner at which fresh water trickles in, one can stay inside for several hours without a worry. Many people – myself included – had brought wine or beers in to enjoy while soaking up the one bit of warmth we’d see for days. To read more about the random places Danielle stumbles upon in her travels, check out Like Riding A Bicycle. We didn’t love Chiang Mai in Thailand. We felt a bit lost! But then we hired a scooter and took to the winding road through the mountains all the way to Pai. Pai itself is a cool wee hippy town, full of expats who visited Thailand decades ago and never left! However the true beauty of Pai is the journey. We stopped off at waterfalls twenty times the size of me as well as hot springs. Craig was disappointed that the hot springs were regulated and you had to pay for them but this ended up being its attraction. There were several different pools and each increased in temperature as they went on. We laughed at the sign that said: please boil your eggs in the top spring. Eh?! I hear you cry. It happened, we spotted a local cooking his breakfast in the heat of the natural spring. Needless to say no tourist was bathing in that pool! Two Scots Abroad (Gemma and Craig) are traveling The Americas on an 18 month career break. Catch up on their stories of trekking to Machu Picchu; diving in Cuba and discovering that Colombia is safe, friendly and not full of druglords as the Western media would have you believe at Two Scots Abroad. In general, hot springs in many parts of the world are in remote cities or mountains. However, Hungary’s capital city of Budapest is practically bubbling with hot springs. The city’s thermal baths date back to the times of the original Roman settlement. These days, the city’s hot springs are frequented by locals and visitors alike. There are so many baths that the city publishes a free, glossy 24-page brochure showcasing all of the spa complexes and various pools. 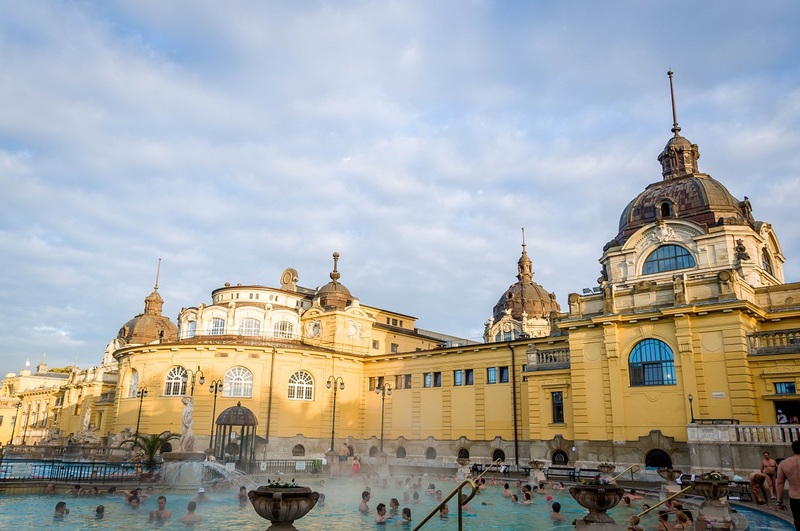 The most popular baths are the grand Art Nouveau styled Szechenyi complex – dozens of indoor and outdoor pools warm and relax visitors. And it is relaxing! Szechenyi’s stylish yellow facade is one of the most photographed sites in Budapest. In contrast, the swanky Gellert Spa caters to an older crowd and has a more relaxed vibe. On our trip to Budapest, we made sure to allow time each day to visit one of the city’s baths. No matter which one you visit, Budapest is the world capital of hot springs! Shovels aren't just for sandcastles at this beach! 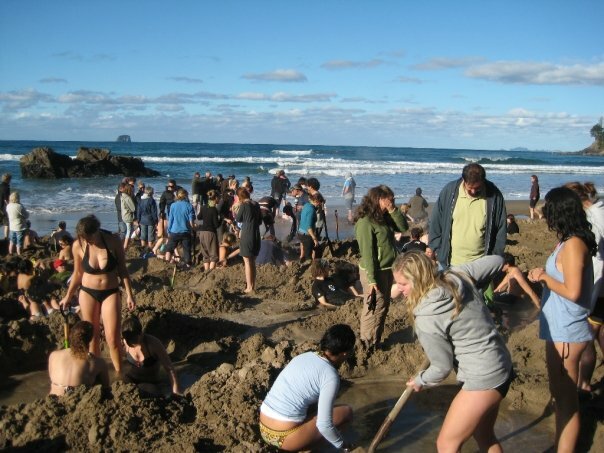 When the tide goes out on Hot Water Beach in New Zealand, visitors rush to dig personal hot tubs in the sand and wait for them to fill up with thermal water from underneath. Former volcanic activity created underground reservoirs of superheated water that escapes to the surface. There are two hot springs at the beach that release water as hot as 147º Fahrenheit. If you're planning to visit, many nearby hostels will provide you with a tide chart and shovels to borrow during your excursion. Kelsey writes this blog. Welcome to Route Words! Stay awhile and look around. Read about another visit to a natural hot spring. In a rush? Come back soon and don't forget to follow me on Instagram: @kelseyohleger. Onsen is the Japanese word for hot springs; on is warm and sen is spring. As a land of constant seismic activity, because it is located near major tectonic plate boundaries and is situated on the Pacific Ring of Fire, this has caused thermal springs, or onsen and bathing in these a 3,000-year history. 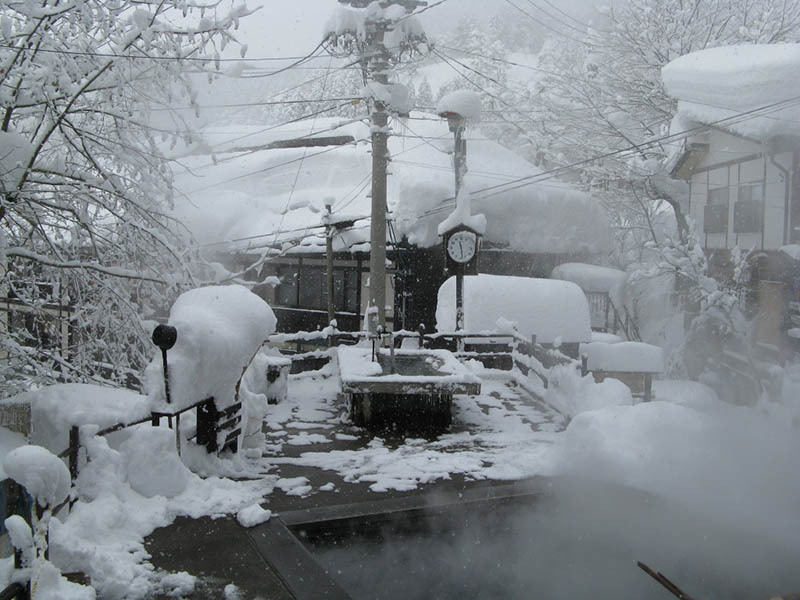 Many people visiting Japan for the 1st time would love to experience onsen – the Japanese natural hot springs. What many people are intimidated by is getting naked in front of a lot of people. One of the most interesting cultural aspects of Japanese life is the almost ritual visits to hot springs or onsen throughout the country. The healing powers of the onsen is well documented. In 1709, Goto Konzan, an Edo doctor, having seen the therapeutic benefits of onsen, commenced the first medical study of hot springs. In World War II, there were over 50 national hot spring hospitals established, and onsen are still used in the treatment of chronic diseases such as rheumatism and hypertension, and many other illnesses. There is a code of ethics to having an onsen, which can be read here, but for a totally authentic experience, go to a local onsen, which are segregated and get naked and enjoy the experience and the therapeutic benefits. Paula McInerney of Contented Traveller is regularly found naked in an onsen in Japan. In the small quiet town at the base of several of Iceland’s northeastern volcanos is the Mývatn Natural Bath. The bathing pools are a man-made but the hot water isn’t. 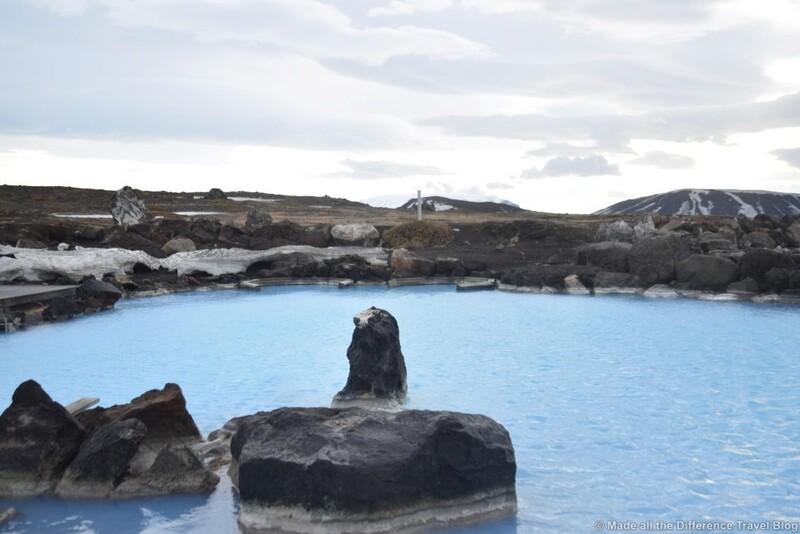 The blue mineral water is heated by the local volcanic activity over 2500 meters below the surface. Icelanders have been using the hot water of Mývatn for bathing long before the man-made pools were made. I visited Mývatn Natural Bath as part of my Iceland Winter Road Trip. It was a clear but windy and cold day. I was torn between trying to keep as much of my body in the warm water and keeping my hair dry. The minerals in the water give it a silky feel and the warm water soaks into your bones. It is a great place to relax after a long day of hiking or driving. Jennifer is taking the road less traveled and hopes to prove that it is as scary as it seems. Join her on her adventures at Made All the Difference Travel Blog. When I was in Greece back in 2010, my friend and I obviously found ourselves in Santorini... a natural choice for those island hopping in Greece. We had planned to go on a full day Caldera boat trip that took us to a spot where we could climb a volcano and then to the hot springs. Our boat was light a pirate ship and since it couldn't go very close into shore where the hot springs are, they basically threw us off the side to swim into shore, a slightly terrifying experience. Once we reached the hot springs, I was surprised that these weren't super hot, although it was fun swimming between naturally hot & cold patches of water that surrounds a Volcano. The mud within these hot springs combined with the water and sulfur is said to be good for your skin and hold healing properties. Lauren hopes to show people that even with limited vacation days, you can still see the world. Get inspired at Twirl the Globe. I will be honest with you. I am spilling more beans here than in my own La Palma blog post where I did not tell where this heavenly spot was located in the first place. 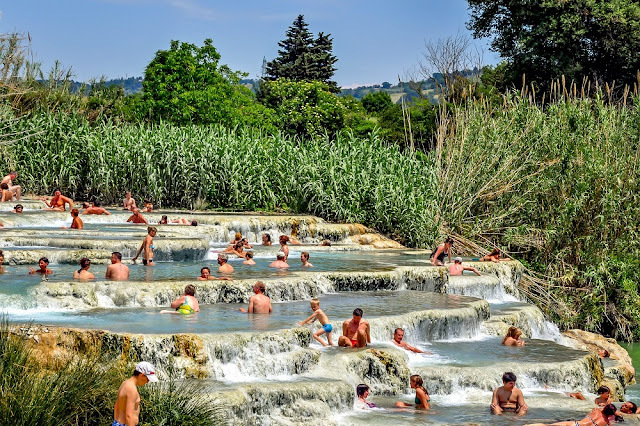 Therefore, and as such post went viral, I got a bunch of mails from readers asking me how to reach these natural hot springs they were looking at in the pictures. Well, just if you promise to keep the secret, they are in Echentive beach, a few steps from the sea in the Southern part of the island (which is everything but warm as this pristine pool). 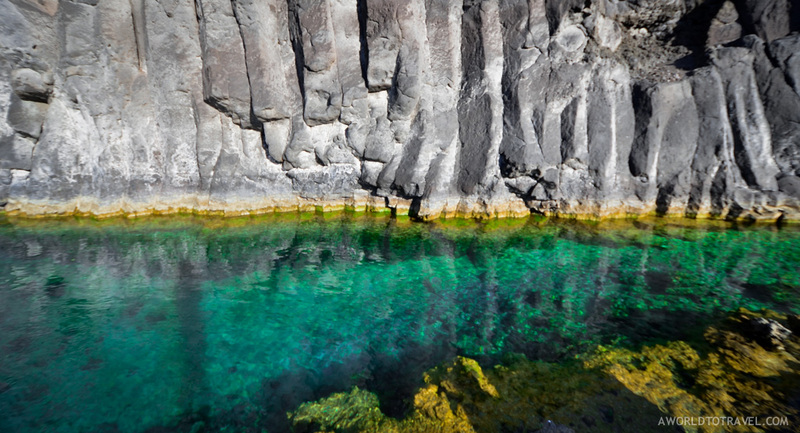 Therefore, next time in the Canary Islands, look forward to pay a visit to La Palma and go find these turquoise waters. Thank me later! Inma was invited by La Palma Tourism to explore the island last Spring. Follow her adventures and misadventures on her blog A World to Travel. Have you visited the geothermal parks in Rotorua, New Zealand? 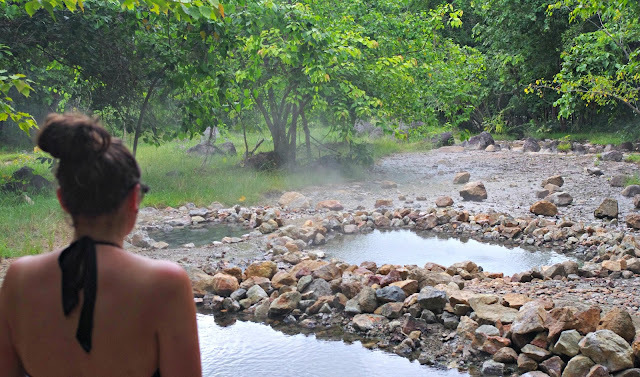 Do you ever wonder what it would be like to bathe in hot geothermal pools? Offering a unique geothermal experience, Hells Gate Geothermal Park not only gives you the chance to walk along hot boiling pools and sulphur lakes, it also offers a personal retreat in a mud bath or a sulphur spa. Overlooking the rest of the park, the mud bath and sulphur spas give you an authentic bath experience, just like the European settlers and Maori did it hundreds of years ago. I really enjoyed the mud bath, which is made of geothermal mud mixed with warm sulphur water from the geothermal pools. You will definitely feel the benefits on your skin. After a long day of sightseeing in Rotorua, a dip in the mud bath was definitely a perfect way to end to our trip. Jon and Gia are a New Zealander-Filipina couple on a journey around the world. Follow their travels at Mismatched Passports. The area surrounding the Arenal Volcano in central Costa Rica is highly volcanic, so there are dozens of hot spring sites to choose from. We went to Tabacon Natural Hot Springs, which is a completely natural volcanic spring, which has been beautifully landscaped and sympathetically sculpted into various different pools, rivers and massaging waterfalls. This is some of the healthiest water in the world, full of salts and minerals, gently massaging tired, aching muscles and rejuvenating your whole body. At only a couple of minutes’ drive from the volcano itself, you can bathe of the steaming hot waters with a view of the volcano that created them towering over you in the distance. Kach from the Philippines and Jonathan from the UK sharing their experience and knowledge of travelling the world at Two Monkeys Travel Group. Which hot spring is at the top of your must-visit list? Are there any springs we forgot to mention?